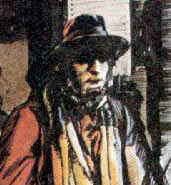 The original run of the Fourth Doctor comic strips (issues 1 to 60) were set between season 17 and 18, while Romana is taking a break away from the TARDIS. The Doctor visits a small English town to stock up on jelly babies, but finds it under attack by robot Roman legionnaires from an alternate timeline. The TARDIS falls through the “dimensional duct” to the alternate Rome, where the Doctor is interrogated by the robot General Ironicus. When he refuses to give up the secrets of time travel, he is thrown to the Ecto-Slime in the arena, and when he survives that ordeal he is made a slave on the Imperial War Galley. A cyborg slave named Morris helps the Doctor to escape, and they make their way to the Imperial palace, which is actually an alien spacecraft. There, the oldest robot in Rome, Vesuvius, leads them to the temple of the gods, whom the Doctor recognizes as the evil alien Malevilus. Morris is killed by robot guards as the Doctor escapes, but with Vesuvius’ help the Doctor finds and releases the Bestiarus, genetically engineered and unstable super-soldiers. As they spread havoc throughout Rome, the Doctor confronts Magog, the leader of the Malevilus, who has taken the form of Juno, the Emperor’s mother. Magog kills Ironicus for his failure, and tortures the Doctor, who uses the television cameras in the Imperial box to broadcast Magog’s true form to the people of Rome. The Romans rise up against their evil gods, but Magog, certain that this setback is only temporary, forces the Doctor to take it to the TARDIS and explain how to operate it. The Doctor tricks Magog into operating a control which traps it in a pocket dimension within the TARDIS. The other Malevilus, trying to escape from the rebels, discover too late that Magog has drained all the power from their ship, which crashes and explodes upon take-off. Time-Placement: The Doctor is still wearing his outfit from Season 17, but will change during the course of the ongoing strip. So we've decided to place these stories chronologically just before The Leisure Hive. Reprinted in Panini graphic novel "The Iron Legion"
The TARDIS lands in a futuristic city where emotion has been outlawed and is erased from the people’s minds in the “harmony booths”. The Doctor is arrested and placed in a brain-wiping machine, but is rescued by members of ZEPO, the emotional freedom fighters. The Brains Trust who run the city decide that the Doctor is too dangerous to live and send the Moderators out of the city to destroy the rebels. The Doctor, meanwhile, learns that each rebel has been practising a single emotion to keep it alive -- and that Big Hate has been breeding millions of the voracious barabara, “blood bugs”, and intends to release them upon the city. When the Moderators attack the ZEPO outpost, Big Hate releases the barabara, which only attack the Moderators; the adrenalin produced by emotional stress is a poison to them. The Doctor and the ZEPO fighters attempt to warn the city of the danger, but are attacked by the Moderators and fail to reach the city in time. As billions of barabara pour through the city, consuming the population, the Doctor manages to transport himself to the home of the Brains Trust and convinces them to restore emotion to the people to save their lives. The Moderator General objects and guns the Brains Trust down, accusing them of treason, but the Doctor is able to overpower him and rewires the “harmony booths” to stimulate hate and fear in the surviving population. The survivors thus gain immunity to the barabara. The Doctor then leaves the people of the city with a record of his own emotional patterns as a blueprint for developing their own. Time-Placement: After The Iron Legion. Time-Placement: This story explain why K9 is not present in the first strips, so we've placed it just before his return in Timeslip. The TARDIS encounters a giant amoeba-like creature which feeds on Time energy and begins to consume the TARDIS itself. Time reverses within the TARDIS as the creature feeds, and K9 disassembles back into his component parts while the Doctor regresses to his first incarnation. Eventually the TARDIS reaches the moment of its activation, and beyond that point ceases to be a time machine. The creature is confused and weakened by the foreign body within itself, and Time begins to flow forward again; the TARDIS is activated once more, and becomes a time machine, and when the creature feeds again Time reverses. The repeated back-and-forth motion weakens and kills the creature, and the TARDIS, the Doctor and K9 return to normal. Time-Placement: After City of the Damned. Reprinted in Panini graphic novel "The Tides of Time"
The Doctor materializes on a ship crewed by alien Wrarth Warriors, who are pursuing a creature called the “Meep”. Assuming that the Doctor is an agent of the Meep, they knock him out and implant a bomb in his stomach. Some of the Warriors then stow away aboard the TARDIS, and the others allow the recovering Doctor to escape. Upon departing the Wrarth ship the Doctor picks up a television broadcast about a mysterious explosion in the British city of Blackcastle, and lands to investigate. Two schoolchildren, Sharon and “Fudge”, have found the Meep hiding in a toolshed near the abandoned steel mill where his ship crashed, and have taken the cute creature back to Fudge’s home to recover from his wounds. They break into the steel mill to search the Meep’s ship for something to help him, but are attacked by the Wrarth Warriors. The Doctor rescues them and takes them back to Fudge’s home, where the Doctor realizes what the Wrarths have done to him and wraps lead panels from the roof around his stomach to shield himself from the detonation signal. The Wrarths, realizing that their plan has failed, attack in person, and the Doctor sends Sharon and the Meep to safety while he confronts the Warriors. Too late, he learns that the Meep is an intergalactic warlord and the Wrarths are the justice patrol sent to bring him to account for his crimes. The Doctor takes the Wrarths to the steel mill, where the Meep has brought the locals and soldiers under his hypnotic control using black star radiation from his ship’s drive; he is now preparing to launch his damaged ship using the interstellar engines, despite the fact that this will destroy the Earth. The Doctor sabotages the engines, and although the Meep is able to take off with Sharon as a hostage, Earth is not destroyed in the process. The Wrarth Warriors recapture the Meep in orbit around the Earth and rescue Sharon, and as the Wrarth Warriors take the Meep to face judgement, the Doctor attempts to take Sharon back home in the TARDIS. Note: The Meep returns in the comic strip Starbeast II and the audio story The Ratings War. The TARDIS brings the Doctor, Sharon and K9 to a cargo hauler in deep space just as it is attacked by the Werelox, wolflike creatures who have been attacking human colonies in the New Earth system. The Doctor and K9 help Joe Beam and his engineer Babe to fight off the Werelox, but during the fight the Doctor is scratched by the Werelox leader, Brill. As soon as he’s exposed to moonlight the Doctor begins to transform into a Werelox himself, but he manages to get to the TARDIS and takes it out of time and space. He thus finds a cure to his condition after three months’ hard work while only minutes pass back on Joe’s ship. Joe takes the Doctor, Sharon and K9, and the captive Brill to New Earth, where the Doctor hypnotises Brill and learns that the Werelox are serving the Daleks. The Daleks begin incinerating planets in the system, and the Doctor takes Brill -- who now believes he’s on the Doctor’s side -- to the Dalek battle cruiser to investigate. There, he learns that the Daleks intend to sterilise the system and use it as a breeding ground for a new race of Daleks. K9 rescues the Doctor and Brill, and the Doctor pilots the TARDIS to the time laboratories aboard the Dalek ship; while Brill holds off the attacking Daleks, the Doctor uses experimental time technology to trap the battle cruiser in a time lock, forever frozen in a single moment in time and space. He then takes Brill back to New Earth and collects Sharon, who informs him that she doesn’t want to go home yet -- she’s having too much fun travelling with him. Time-Placement: After The Star Beast. On the planet Nefrin, the criminal Brimo is sentenced to perpetual imprisonment within an Eternity Capsule for conspiring to alter the course of Universal destiny. After millions of years her system’s star collapses into a black hole, and Brimo awakens in a pocket Universe where her every wish becomes reality. The mini-Universe, however, is drawing energy out of the real Universe, until the passing TARDIS becomes stuck in the rift and prevents energy from passing through. Brimo attacks the Doctor, who uses his own mind to create weapons with which to defend himself. When Brimo’s power becomes exhausted, the Doctor challenges her to think of the worst thing imaginable -- and she becomes trapped in the Eternity Capsule again, this time forever. The Doctor and Sharon return to the TARDIS, but when they pass through the rift back to the real Universe, Sharon ages four years all at once, bypassing adolescence and becoming a young woman. Time-Placement: After The Dogs of Doom. The TARDIS materializes in a Chinese fishing village in the year 1522 AD, where warrior monks are fighting pirates with uncharacteristic fierceness -- and the Doctor and Sharon find evidence that an alien weapon has been used. Abbot Yueh, puzzled by the strangers, takes them back to Shaolin monastery as prisoners. The Doctor learns from the novice Chang that the monks have been practising martial arts for centuries; but ever since Yueh took over from the former abbot Hsiang, the monks’ abilities have been tested by the “bronze men” in a secret chamber. The Doctor slips out of the monastery to question Hsiang, who has apparently become a hermit. Hsiang informs him that some time ago a star fell to Earth, and Yueh went to investigate; when he returned, he deliberately crippled Hsiang and left him here on the mountain. The Doctor returns to the monastery, but his absence has been noted and Yueh pursues him into the hall of the bronze men. The Doctor discovers that the “bronze men” are Sontarans, but he manages to escape, and Chang accompanies him and his companions in their flight, seeking answers. Hsiang directs them to the site of the fallen star, a Sontaran scout ship with a damaged hyperspace transmitter. The transmitter requires quartz crystals to function, and Chang informs the Doctor that the Emperor owns a similar crystal the size of a man’s fist. The Doctor questions Chang about his training with the “bronze men”, and realizes the monks have been given post-hypnotic commands. When they learn that the Emperor has invited Yueh to bring his monks to demonstrate their abilities to his court, the Doctor realizes that Yueh intends to order the hypnotised monks to the Emperor. But while Yueh believes he will then become ruler of China, the Sontarans will in fact use the Emperor’s crystal to repair their transmitter, summon reinforcements, and conquer the Earth. Time-Placement: After The Time Witch. Reprinted in Panini graphic novel "Dragon's Claw"
The Doctor successfully returns Sharon to Blackcastle, although she isn’t sure she wants to return now that she’s grown up. The decision is taken out of their hands when they are accidentally kidnapped by alien anthropologist Varan Tak, who has been stranded in Sol’s asteroid belt for centuries. To alleviate the boredom he has been “removing” samples of human civilisations from the planet and keeping them in time stasis capsules while awaiting rescue. The Doctor offers to bypass the ship’s safety procedures and allow Tak to teleport to Earth so he will have company at last, but learns too late why the ship wouldn’t let him go; the artificial intelligence which runs the ship had fallen in love with him and was trying to protect him, as Earth’s industrialised atmosphere would instantly kill him. This has in fact happened, but the Doctor uses the distortion caused by the time stasis capsules to correct his mistake. He is able to take the TARDIS back in time only a few minutes, interrupting himself and destroying the teleport mechanism. The alternate future in which Tak died ceases to exist, and he must content himself with remaining to await rescue. The Doctor takes Sharon to visit old friends on Unicepter IV, where the latest craze is shared dreaming, a process made possible by telepathic animals called slinths. Dream co-ordinator Vernon Allen and his slinth Miki prepare a poetic dream for the Doctor and his friends, but the Doctor hears that Lord Veith and his own entourage recently died during a shared dream and takes precautions just in case. When the dream unexpectedly turns violent, K9 detects the change in the Doctor’s life-signs and breaks his connection to the others, and the Doctor in turn rescues them before the fright causes them all to die of shock. The source of the nightmare turns out to be Miki, who has been feeding on their fear. As Miki flees, reports of similar incidents come in, and the Doctor realizes that the slinths are psychic parasites who have now grown strong enough to attack openly. The slinths form themselves into a group body in the shape of the Devil to generate more terror in their victims, but when the Doctor realizes that the “devil” is also feeding on electrical energy he is able to short it out using an electrical cable and a firehose. The slinths’ gestalt is broken and the security forces are able to mop them up. In the aftermath, Vernon must start a new life without his slinth, and Sharon -- who must also start a new life now that she’s grown up -- decides to remain on Unicepter IV with him. A dimensional warp brings the Doctor and K9 to a beach and a rock to which the Titan Prometheus has been chained as punishment for bringing the spark of Life to the galaxy. The Doctor and K9 free him and use the TARDIS to take him to the planet Olympus, where the gods are still angry at him for scattering Life across the galaxy before it had been perfected. Zeus has Prometheus locked up and sends the Doctor to Asclepius for dissection, but the Doctor manages to escape and frees Prometheus. Before departing, Prometheus once again steals Zeus’ precious life spores. The Doctor, K9 and Prometheus reach the TARDIS and flee just as the enraged Zeus attempts to smite them with a thunderbolt. The thunderbolt scrambles the TARDIS’ navigational systems, so that when Prometheus departs to spread the spark of random Life throughout Zeus’ sterile galaxy once again, the Doctor can’t be sure whether he’s just left Earth -- or is just approaching it. Time-Placement: After Dreamers of Death. The Doctor wear is burgundy Season 18 outfit, but reference is made to the randomiser so it's still prior to The Leisure Hive. The TARDIS lands on the library world Biblios, where a vicious battle is being fought in orbit between the Vromyx and Garynths. The two species are each attempting to prevent the other from gaining access to the planet’s data on super-weapons, although the robot librarians have repeatedly told them that there are no such records. The Doctor uses a map of the library to locate an empty storage facility, and then contacts the fleet leaders and informs them that he intends to ensure neither species will ever get its hands on the super-weapon data. He then destroys the empty building, and the fleets, assuming that there is no longer anything to fight over, depart empty-handed. Time-Placement: After The Life Bringer. The Doctor arrives on an alien planet at the same time as a survey team from Earth. At first the planet seems idyllic, until the surveyors see the friendly humanoid natives sacrificing themselves to a giant spider which webs them up, apparently for future consumption. As the crew sets about destroying the spiders to make the planet safe, the Doctor finds a villager hatching from an egg and realizes the truth too late. The humans have already destroyed all the spiders by the time he reaches them, and he informs them that the villagers’ and spiders’ relationship was symbiotic; the humanoids caught food for the spiders, who in turn wove cocoons for the villagers, thus enabling them to transform into beautiful flying creatures like humanoid butterflies. They will do so no longer. Time-Placement: After War of the Words. The TARDIS materializes during the Millennium Wars, and a fault in its gravitic stabilisers causes a soldier’s ship to crash nearby. The soldier captures the Doctor and forces him to use the TARDIS’ gravity field to disorient the pursuit ship following him. When the soldier leaves the TARDIS to finish off the pursuit ship, the Doctor locks him out, repairs the damage and escapes, leaving the soldier to be killed by the king-sized pursuit ship which was following the first. The TARDIS materializes in the subway system of a dystopian city, where years of industrial pollution have transformed the street gangs into cannibal mutants. The Doctor is saved from the cannibals by the Guardian Angels, the few remaining “normal” humans, and taken to their headquarters; there, an elderly engineer is trying to repair the connections which will take the Angels out of the city to the fabled Countryside. The cannibals track down their prey, however, and slaughter most of the Angels while trying to get to the Doctor. The Doctor sends the surviving Angels out of the city on the last remaining train while he remains behind, completing the engineer’s work just as the cannibals break in. The cannibal Chief tries to kill the Doctor but electrocutes himself in the machinery, and the Doctor escapes as the Chief’s fellows fall upon his carcass. Curious, the Doctor uses the TARDIS to follow the tracks to the end of the line -- only to find that the open countryside is a sterile, poisonous wasteland, and that there is no sign of the train carrying the last of the Angels. The Doctor visits the Festival of the Five Planets, which used to be the Festival of the Six Planets until the sixth planet broke off from the rest of the Federation and began intermittently raiding the other five. The Doctor and noted science fiction author Dr Ivan Asimoff are invited on a test flight with the stunt pilot Machine-Head of the Free-Fall Warriors, but during the flight they run into a raiding party from the sixth planet and are shot down over a nearby asteroid. While the Doctor repairs the damage, Machine-Head contacts the rest of the Free-Fall Warriors, who set off to deal with the raiders themselves. The Warriors successfully destroy the raiding party before it can pose a serious threat to the Festival, and are greeted as heroes upon their return. Time-Placement: After End of the Line. The TARDIS is swept up as scrap by Flotsam and Jetsam’s space salvage vessel. Inside, the Doctor finds a Cyberman amongst the scrap and hits it with a wrench before realizing it was already dormant; Flotsam and Jetsam have found a few of them before, and have reprogrammed them to serve as butlers. This particular Cyberman, however, is reactivated by the Doctor’s attack, and it kidnaps Jetsam and uses the TARDIS to take him to a planet on which an entire Cyberfleet has crashed. There, it orders him to repair the dormant body of the greatest Cybernaut of all time. Jetsam does what he does best, and transforms the greatest Cybernaut of all time into a butler. Meanwhile, the Doctor, Flotsam and the junkyard robot Dutch follow a long shot and travel to the nearest inhabitable planet in the sector where Flotsam and Jetsam found the last two dormant Cybermen. They arrive just in time to save Jetsam from the vengeful Cyberman, and Dutch destroys it by spraying it with polymer paint which shorts out its electrics. Flotsam and Jetsam now have an entire Cyberfleet to salvage. The TARDIS is summoned to a great castle where the last defenders of Earth are attempting to prevent the vicious Catavolcus and his army from seizing control of the Dragon, a powerful nuclear reactor. An elderly wizard, who claims to have been summoned from another time to aid in Earth’s last battle, also claims to have channelled a greater power to summon the Doctor to this place and time. Before the Doctor can stop him, the wizard sets the reactor to overload, explaining that the defenders can now escape in the TARDIS. Catavolcus’ army storms the castle, and the leader of the defenders gives his life to hold him off while the others escape. As the TARDIS departs, the Dragon explodes, wiping out Catavolcus’ army. The Doctor recovers in a distant forest some time later, near the empty TARDIS, with no memory of his escape -- knowing only that the wizard and his king referred to each other as “Merlin” and “Arthur”. As he prepares to depart, Merlin appears to him in a vision and tells him that they will meet again. Time-Placement: After Junkyard Demons. This is the last ongoing comic strip featuring the 4th Doctor in Doctor Who Magazine. This story is continued in the Fifth Doctor comic strip The Tides of Time. The Doctor and Romana visit Kolpasha to see the new season’s fashions, but instead stumble across a crime scene. The Doctor studies the murdered designer’s records and finds that she was taking the drug Vitality, as was another designer who was also murdered earlier that day. The Doctor breaks into the Vitality storage centre, where crates of Vitality are ready to ship out across the human empire. The warehouse’s owner, Gevaunt, confronts the Doctor and transforms into a Quoll -- one of a race of rapacious carnivores who have eaten the Reft sector clean of all living species. Human flesh is inedible to the Quoll in its natural form, but the Doctor realizes that the anti-aging effect of Vitality is a side-effect of a drug which is intended to make human flesh edible. Gevaunt’s hunger got the better of him and he killed and ate the two designers; he now pursues the Doctor to silence him, but the Doctor manages to get to the Superintendent of Kolpasha first with his story. Gevaunt tries to pass himself off in human form again, but the Doctor sprays his own arm with Vitality, and once again Gevaunt’s insatiable hunger gets the better of him. As he transforms back into his natural form and attacks the Doctor, the Doctor sprays Vitality straight into Gevaunt’s mouth, and the overdose causes his metabolism to accelerate until his body literally explodes. Time-Placement: Romana is wearing her outfit from Destiny of the Daleks, suggesting this story takes place soon afterwards. Time-Placement: The Doctor and his companions expect to find the Loch Ness at the start of the story, so we can assume they're trying to answer the Brigadier's call as seen in Terror of the Zygons. Note: Sarah’s disappearance is explained in the Seventh Doctor comic strip Ground Zero. ‘Doctor Who’ fan writer and artist Sean Longcroft, while trying to write a Who story for the BBC, has a visit from an old friend; the Doctor himself, who helps Sean to remember how he used to feel about ‘Doctor Who’, why he fell out of touch with the programme, and why it’s so important to remember how he really feels about it. The Tracer leads the Doctor and Romana to Vyga 3, where a Segment of the Key to Time is apparently located inside a briefcase which the criminal kingpins have taken from a laboratory in the desert outside the city. The Doctor, Romana and K9 flee with the briefcase, and the different criminal gangs join forces to get it back from them. K9 scans the case before the Doctor opens it, and determines that the chronal radiation inside does not match that of the Segments. The Doctor, Romana and K9 retreat to the TARDIS, leaving the case behind, and one of the greedy criminal kingpins opens it without waiting to listen to the kingpin who knows what’s inside. The briefcase in fact contains a fluctuating chronon wave, a weapon from the desert laboratories, and when the kingpin opens it everybody in the vicinity ages to dust within seconds. Time-Placement: Romana is wearing her outfit from The Ribos Operation, suggesting this story takes place just after. On the planet Shontaa, two Zygon warlords, Anktra and Kestral plan to carry out a traditional dual. This involves fighting to the death using a variety of host bodies. This dual is observed however by the Doctor and Leela who are on Shontaa for a picnic. The Doctor realizing that the Zygons must have the hosts they are mimicking locked up, locates the Zygon ship and frees the prisoners. Although Leela believes the zygons will be killed the Doctor points out that they are the only ones who can fly the ship. Time-Placement: Leela is travelling alone with the Doctor, suggesting the story takes place prior to The invisible Enemy. Since she's wearing is wearing her orginal outfit, we've decided to place it before The Talons of Weng-Chiang. The Doctor and Sarah materializes on Vortis, where a survey team of Menoptera has disappeared while investigating the appearance of strange energy emissions. The only survivor, the wingless Jresta, takes the Doctor and Sarah to a large crystal in a forest clearing, but can’t remember what happened after her team discovered it. A follow-up expedition led by the hostile Vursus arrives, and he orders one of his team to break off part of the crystal for analysis, ignoring the warnings of the wingless Jresta and the alien Doctor and Sarah. The crystal glows with light which mesmerises the Menoptera and causes them to fly into the energy web, where they are consumed; Jresta only survived because she was unable to fly. The Doctor uses his sonic screwdriver to generate a resonance pattern which shatters the crystalline entity, saving Vortis once again. Time-Placement: Sarah is wearing her outfit from The Hand of Fear, suggesting this story takes place soon before. The Doctor plans to attend his companion Sharon’s wedding on Unicepter IV, but instead ends up in Blackcastle, where he first met her. Beep the Meep has successfully convinced the Wrarth parole board that it has changed its ways, and has returned to Blackcastle to recover its spare black star drive from beneath the movie theatre which has been built over his former landing site. The Doctor finds him, and uses the film projector as a black light receiver, transforming the furious Beep into a character within a Lassie film. Time-Placement: The Doctor plans to attend Sharon's wedding, so this is probably set soon after her departure in Dreamers of Death. He's also wearing his new burgundy outfit.